MSF medical staff vaccinates a child during a meningitis vaccination campaign in Katsina state. Meningitis, a disease responsible for thousands of deaths in Africa, is currently spreading in several West African countries. While ensuring quick access to treatment for those already infected, Doctors Without Borders/Médecins Sans Frontières (MSF) is also starting mass vaccination campaigns in Nigeria and Niger and is closely following the situation in other countries in the region. MSF is planning to vaccinate between 4 million and 5 million people against meningitis. Dozens of MSF teams are mobilized, in cooperation with the ministries of health, to respond to meningitis epidemics. They will ensure treatment is available for people who show symptoms of meningitis at the local level and will contain the epidemic by vaccinating people at risk. Vaccination in populated urban centers is the top priority in order to prevent the spread of the meningitis epidemic. Epidemics are moving fast, and rapid response is required. In addition to hiring hundreds of workers locally, MSF has sent 80 international staff to Niger, and 98 to Nigeria. Meningitis is a contagious and potentially fatal infection of the brain membrane. The current epidemics in West Africa are caused by the strain A of the Neisseria meningitis bacterium. Without treatment, bacterial meningitis can kill up to 50 percent of people who present clinical symptoms of the disease. Most deaths occur within 48 hours of showing symptoms such as sudden, intense headaches and nausea. In order to make treatment available to patients as early as possible, MSF teams are providing meningitis treatment in health centers and referring complicated cases to hospitals. In close partnership with the Ministry of Health at federal and state levels, MSF teams are vaccinating and treating people in nine states across northern Nigeria. The total population of the area is 38 million. The 31 surveillance teams have so far recorded 20,448 cases, along with 694 deaths, in these states. The relatively low case fatality rates (CFR) reveal that people are receiving appropriate, effective, and timely treatment. Simultaneously, 77 MSF teams with health ministry workers are carrying out a mass vaccination campaign. So far, around 700,000 people have been immunized in the most affected states of Jigawa, Katsina, and Sokoto. New vaccination campaigns are going on or to begin soon for 2 million people in Jigawa, Bauchi, Gombe, Kaduna, Kebbi, Sokoto and Zamfara states. The teams are currently working on defining the next priorities. Campaigns are prepared for 270,000 additional people. In total, if all campaigns are carried out, more than 3 million people would be vaccinated during the meningitis epidemic by MSF in Nigeria. Nigeria’s national Ministry of Health has supplied 2.3 million doses of the meningitis vaccine. MSF emergency staff have arrived to reinforce the teams who are working in nutritional and medical programs in Niger. In close partnership with the Ministry of Health at the national and regional levels, MSF has already started vaccination campaigns in Zinder, Maradi, and Dosso in southern Niger. In total, more than 2 million people will be vaccinated, mostly in the Maradi and Zinder regions. 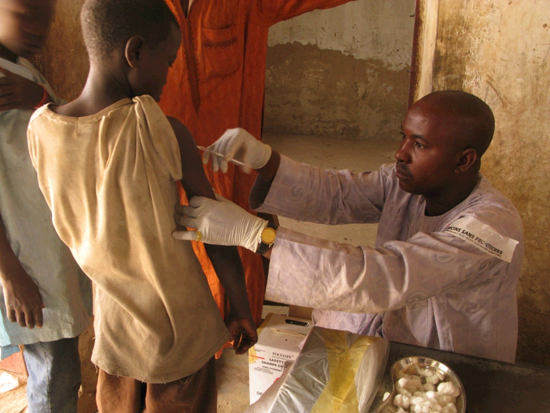 In the Maradi region, the Ministry of Health has reported 1,428 people suffering from meningitis, including 44 deaths. In addition to treating sick patients, MSF teams, supporting Ministry of Health staff, have vaccinated 140,000 people in the city of Maradi. As the epidemic is rapidly moving, MSF has launched vaccination campaigns in Madarounfa and Tessaoua districts, and will start working soon in Aguié district. The total target population for this campaign is estimated to be around 900,000 people. In the Zinder region, MSF mobile teams are supporting the health units to provide medical care to meningitis patients in all the areas where there are cases. In parallel, 60 vaccination teams are going to cover four districts, mostly in rural areas. More than 270,000 people have already been vaccinated and campaigns are ongoing. Around one million people should be vaccinated by the end of April. In Burkina Faso, Chad, and Cameroon, MSF teams are monitoring the situation due to an increase in meningitis cases.